The story was great. Honestly from Diamond and pearl movies this is the best. We see palkia, Dialga and Gitatina again and that was a sorprise. I thought this movie will decribe a Giratina and Dialga battle, but the battle was between this three and Arceus. THe art was good. Not the best and not the worst. Its like always, so I put an 8 in art. The same goes to characters. The three protagonist are the same, and I think Sheena was a great chaacter. In oveerall I put an 8 becouse of this: There are more pk movies and are better than this, but this movie is really enjoyable. I cannot help but feel a little disappointed. While this movie was another decent Pokémon film, it falls short when compared to the others. To understand some of the images and references in this movie, I suggest you watch the two previous Pokémon movies first: "The Rise of Darkrai" and "Giratina and the Sky Warrior". You will better understand where those other legendary Pokémon are coming from. As a rule, Pokémon movies aim to touch the audience and make them sympathize with the cause presented in the film. While I could understand Arceus' anguish, that was about it on an emotional level. This movie just didn't do anything for me. They assumed too much, not bothering to work for it. Team Rocket was just tossed around for a few brief comical moments. Our heroes did nothing overly spectacular. The new characters remained empty and uninteresting. I'm not sure if I liked Arceus' voice, either (although that isn't relevant to the story, right?). I guess after making 11 movies prior to this one made them a bit lazy and they didn't bother making this as sharp and dazzling as some of the other movies are. A shame, because there was potential in this. It was very nice to see Dialga and Giratina again, though. Arceus and the Jewel of Life, also known as 劇場版ポケットモンスター ダイヤモンド&パール アルセウス 超克の時空へ 主人ガーマドン, is the closing part of the Diamond and Pearl Pokemon trilogy. 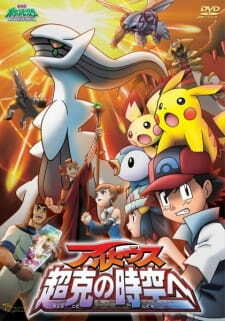 Centered around Dialga and Palkia, followed by Giratina and Shaymin, this film unveils Arceus, the Pokemon god. All the previously explored legendaries make an aprearence too. Except for Shaymin. Deciding to go the epic route, this film had some big shoes to fill. The Rise of Darkrai was the best film since Latios & Latias and considering that that it dominated the last 7 films, Arceus's Jewl has big shoes to fill. Opting to use the classic action epic mold with all the classic time travel tropes, they obviously emulated Darkrai's approach. Arceus's trilogy-closer fell short in the end, but not spectacularly, mind you. Being a fine watch, it offered nice action, occasional bad CGI and a timetravel story with questionable logic. What stands out here is the ammount of mayhem and overt destruction the legendaries cause. For example, mountain is split apart before our eyes. In Darkrai's flick, the world is being peacefully eroded by pink ether. Darkrai used this threat as a plot mover while Arceus finds its use more in the ecstatic violence for its own sake. And it works. There's a lot of it, but never enough to get boring. Timetravel plot itself is servicable. I've found some joy in recognising all the classic time travel tropes. While the whole thing almost never feels as serious as it should be and there's quite a few nitpicks and plotholes I can point to, what is there never gets too dumb to watch. Arceus himself has an unambitious but slightly interesting story to tell. There's not much else to say. To recap: The story is full of holes, but somewhat competently string together. Action is pretty good, but not the best ever. Movie is never stupid, just sometimes dull. Arceus has a fantastic scene or two and the whole thing feels like a passable time waster that's hard to get upset about. To start off i have been a fan of Pokemon (like most of the people who watch these movies) but with this being the 15th movie in the series i think that the movies have had there hay-day. To start off with i found the story Terrible. It feels like the same movie story the have been doing and still are doing for the last few years. Even though its a children's movie it needed something like the first movie which for me is still watchable to this day. The art is something i do like in these movies and is getting better and better. I find the background bright colourful and enjoyable with some scenes i would love as a picture on my wall. Im taking the sound quality from the English dub and found the songs and music great but what let me down was the characters voices. apart from Brock the other characters seem to have no emotion in there voice. Characters have the same problem as the voice they show no emotion and just seem to be there for the ride. Enjoyment compared to other pokemon movies is low for this one as it hasn't got the same enjoyability as previous movies. Overall for art and some songs its a great movie and great for children getting into anime but if you after a plot heavy movie look elsewhere.